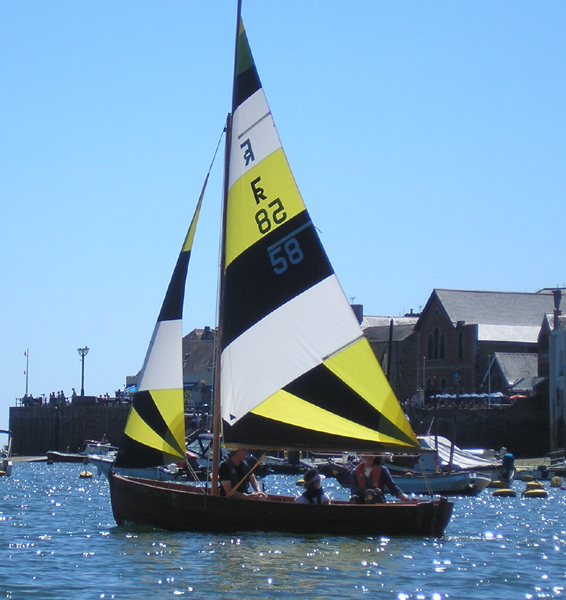 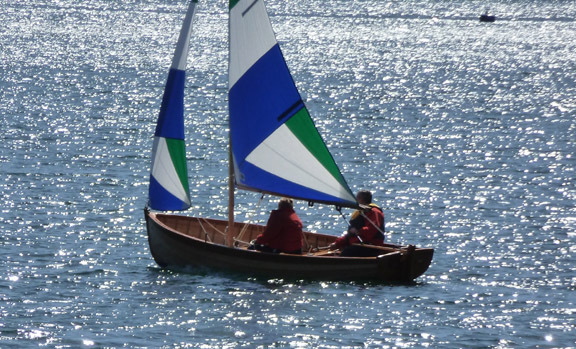 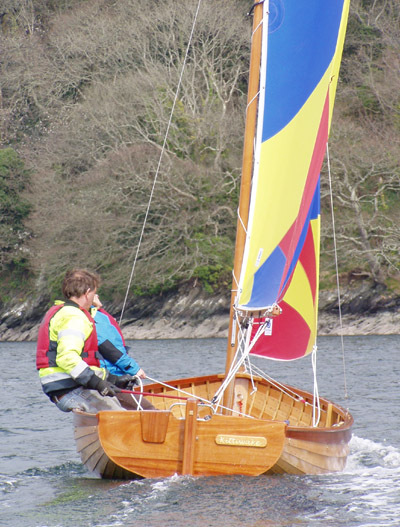 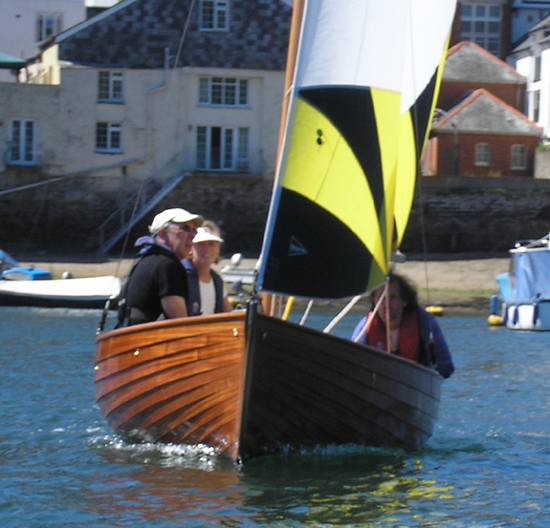 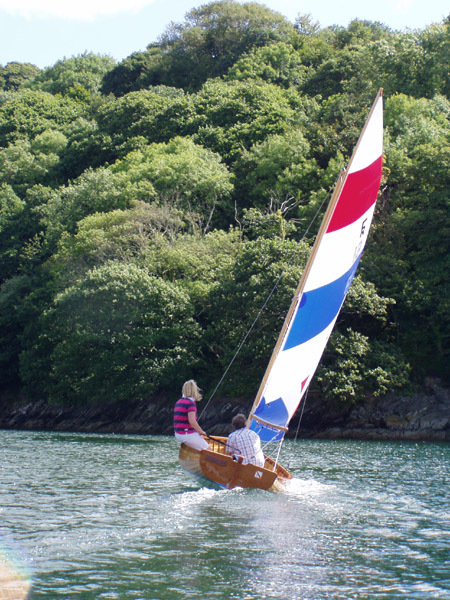 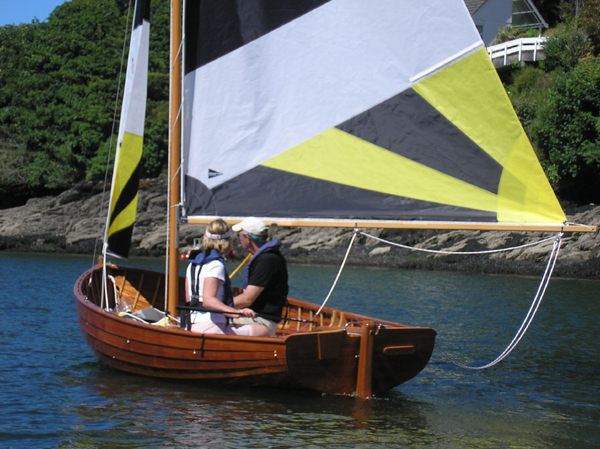 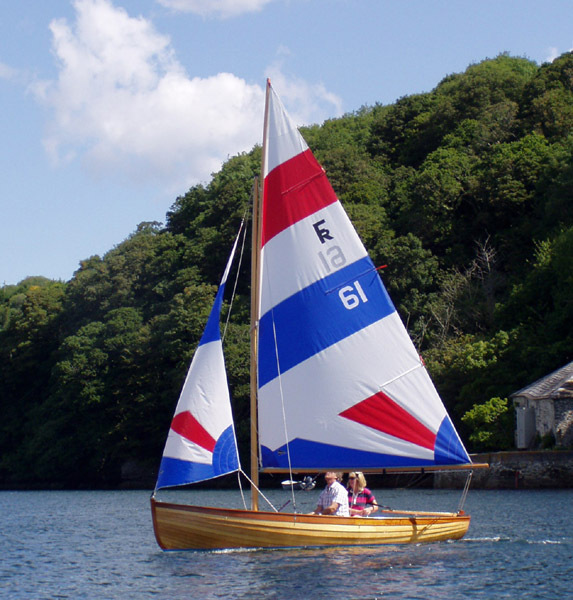 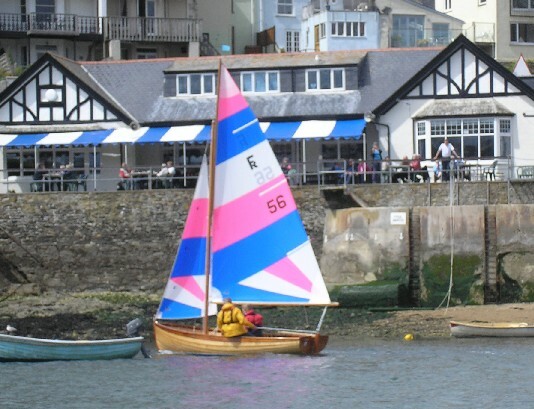 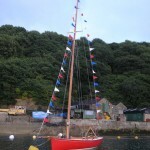 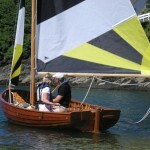 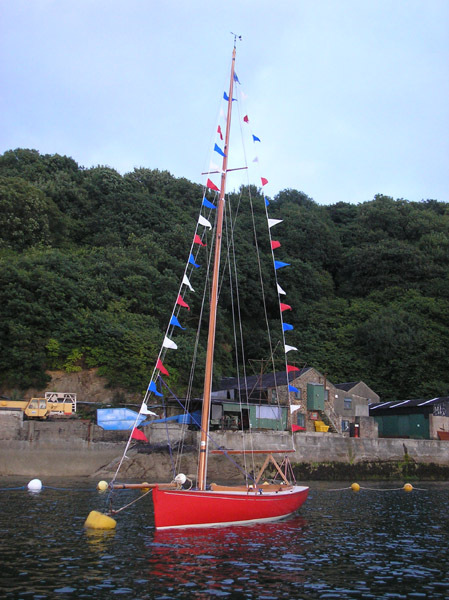 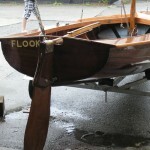 The latest Fowey River clinker sailing dinghy was launched a couple of weeks ago, number 61 in the fleet, named Puffling, the boat was built for world champion sailors Kim and Sarah Furniss, who intend to race competitively in the fleet at Fowey. 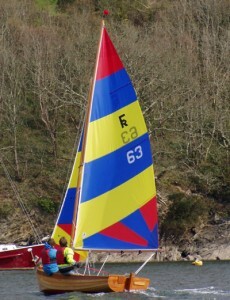 Kim and Sarah were world champions in the Dart 18, and also raced Tornado cats in Olympic qualifyers, but have now decided on something a little more sedate, but possibly just as challenging – racing around Fowey harbour-with its fickle winds and frustrating tides- and hopefully encouraging other Fowey River sailors to get on the water. 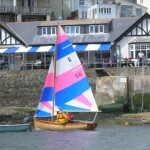 St Mawes One Design no. 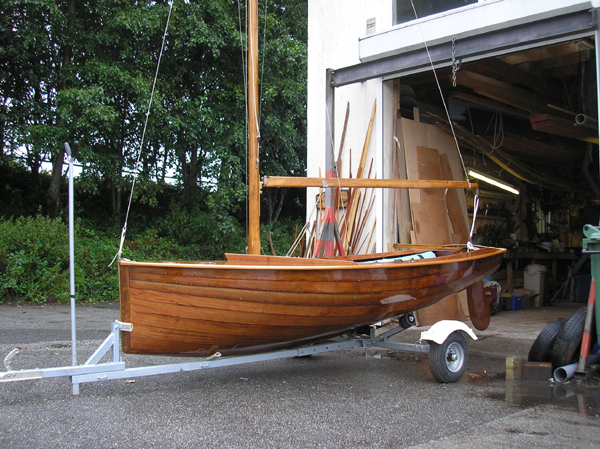 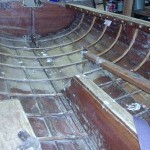 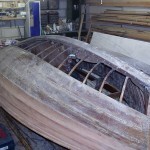 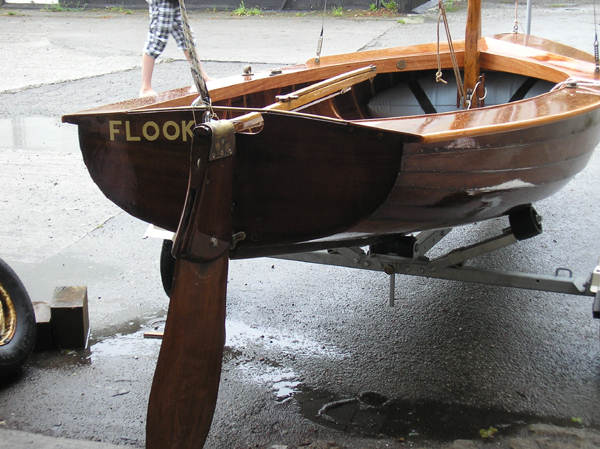 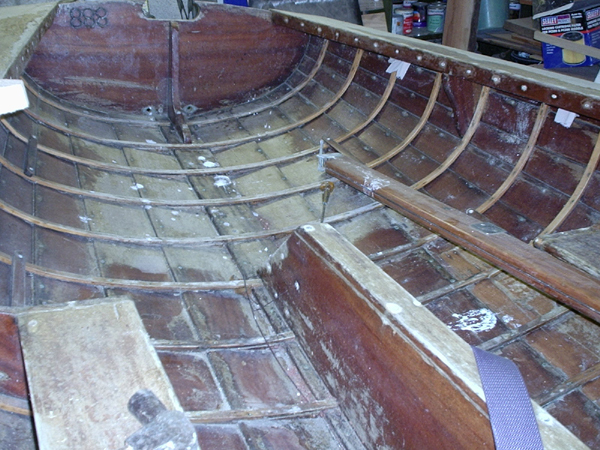 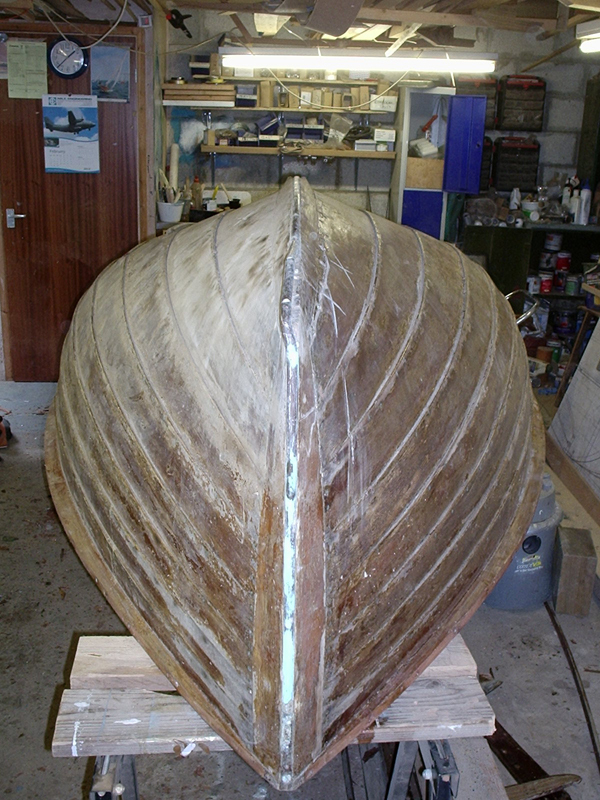 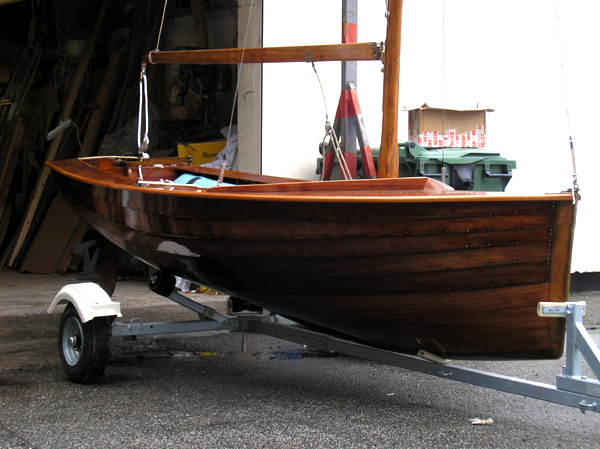 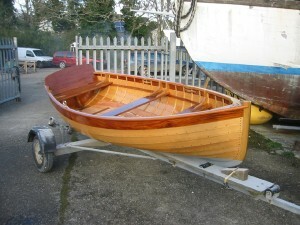 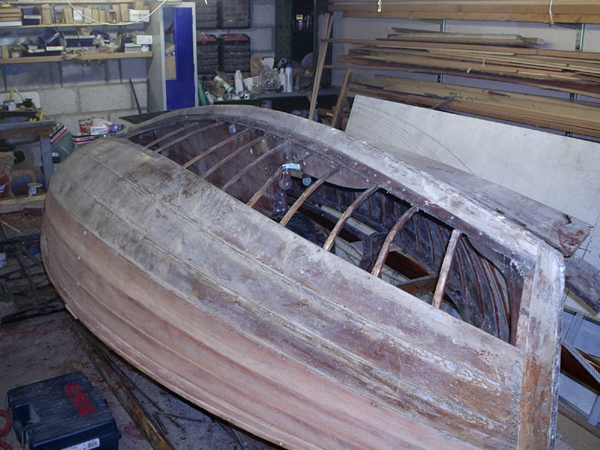 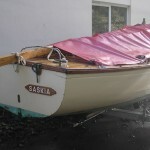 21 ‘Saskia’ is outside the workshop waiting to come in for a few repairs, and some new floorboards. 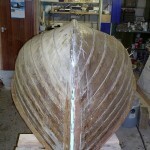 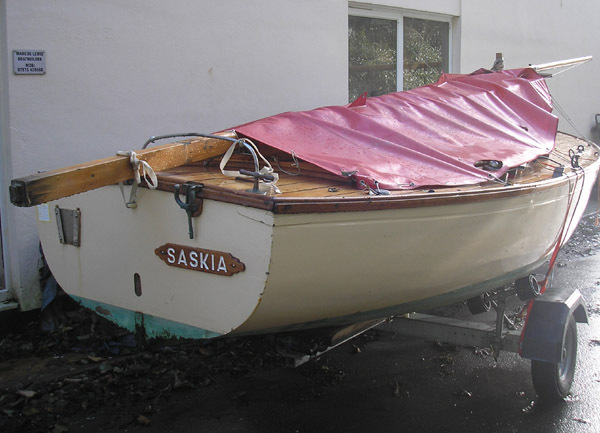 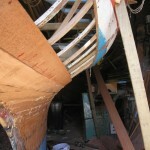 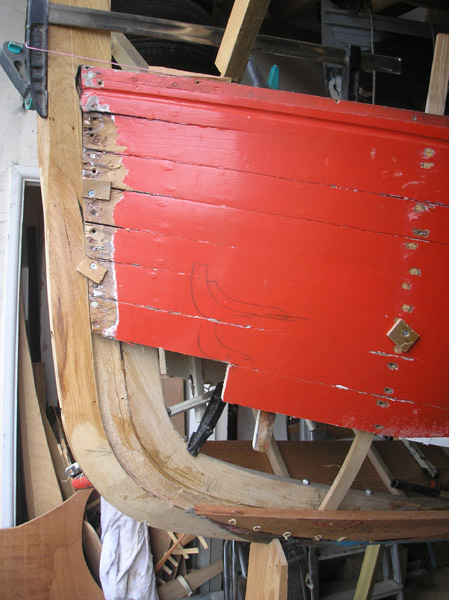 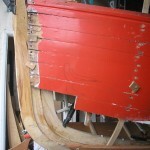 Saskia took the brunt of a Ribs Outboard propellor while on her moorings in a gale, and has suffered damage to four of her topside planks on the port side. 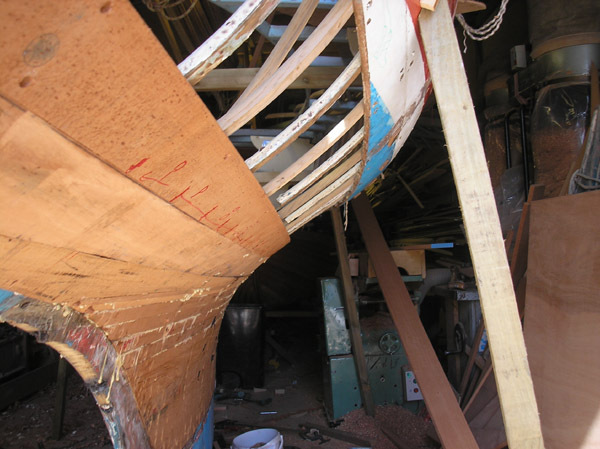 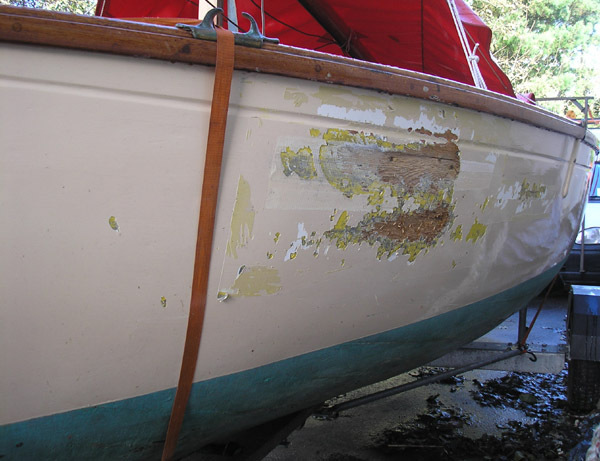 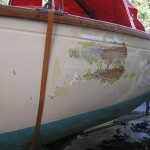 Another boat collided with her port side near the transom, and damaged the deck, rubbing strake and covering board. 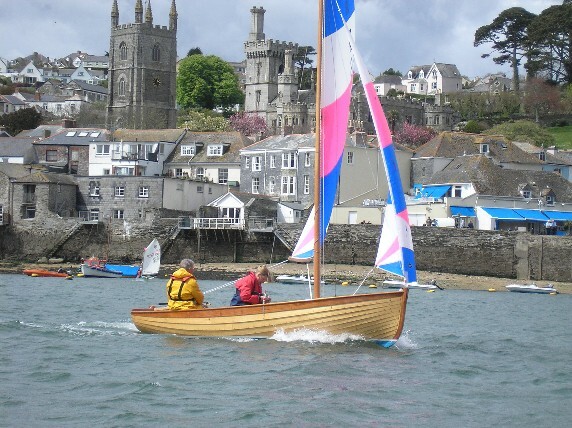 Just in time for Fowey Regatta Week (One of the best on the South Coast) Ruby, the Troy Class Yacht was re-launched after an extensive re-build. 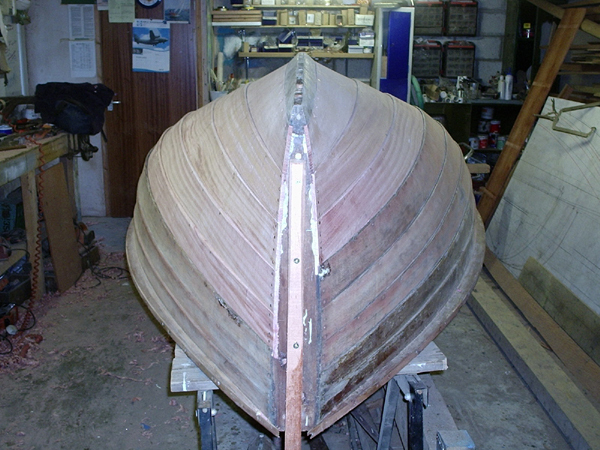 This involved rather more than planned, but included complete re-planking, all new steamed Oak timbers, new stem, new transom and decks. She survived a tough week of racing very well, and with a fleet over twenty boats, she collected a third prize in one race. 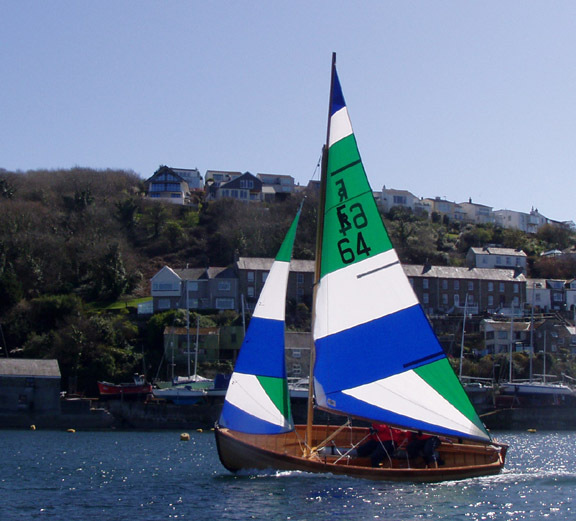 Built in 1930, she is one of the few older Troy Class yachts that has been constantly raced, so a rebuild will give her another 80 years of racing to enjoy. 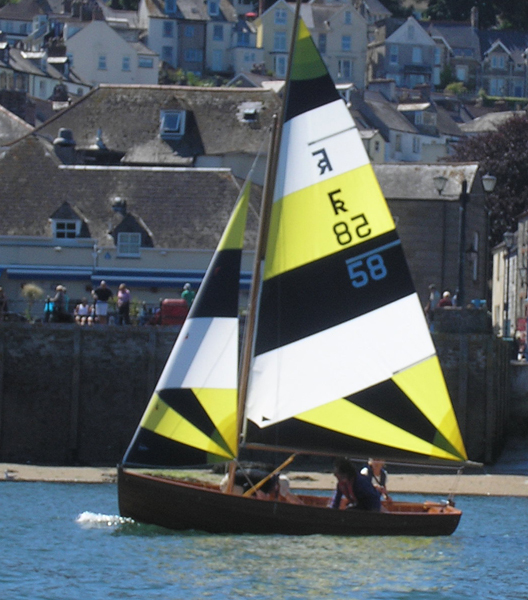 In a fresh Westerly breeze on Sat 11th Sept, Ruby led the fleet out of the harbour and around 3/4 of the course, only to be overtaken on the last beat, by Troy no 26, and finished 2nd, an excellent result. 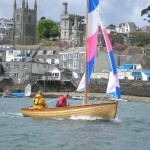 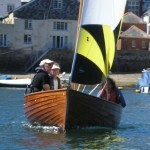 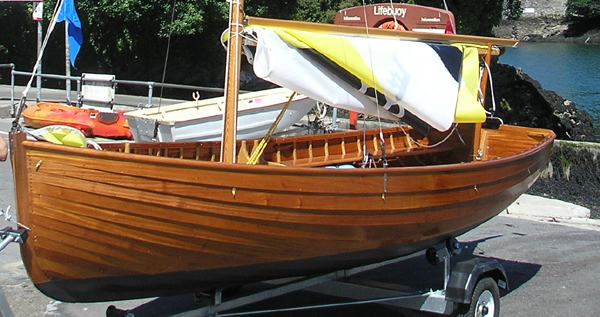 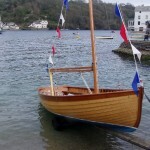 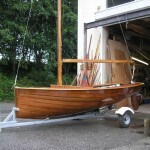 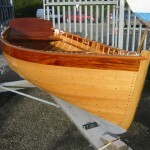 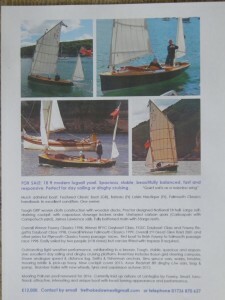 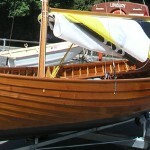 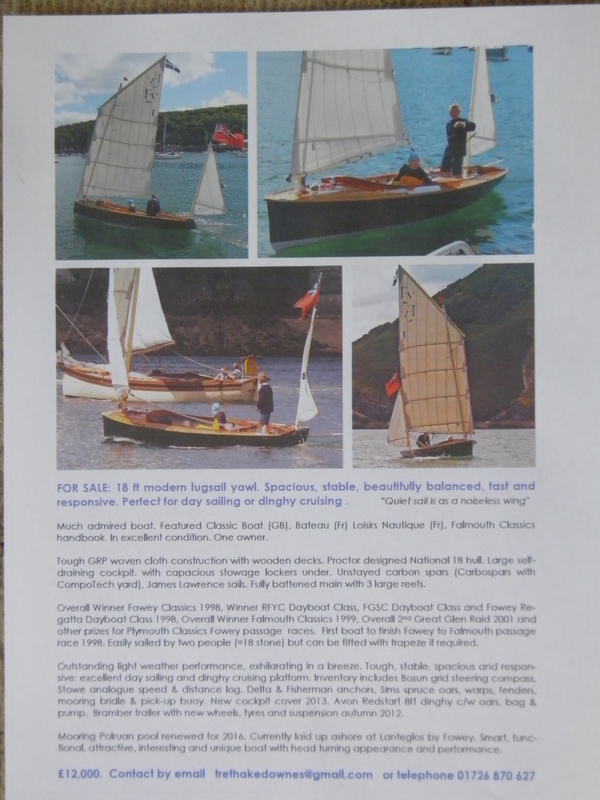 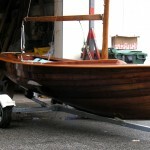 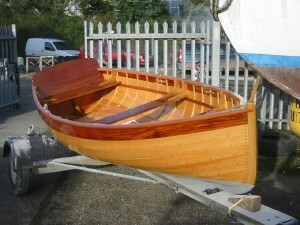 Penguin was launched in June, number 58 in the fleet of Fowey River Dinghies, and the fifth built by Marcus in the last few years.15 feet long, 5’9″ beam, with a steel centreplate, built of FSC Mahogany from Stones at Salcombe, with steamed Oak ribs, all fastened with traditional copper nails and rivets, with sails and cover by Mitchell Sails in Fowey, The Class has been going for 60 years, originating from a design published in Yachting Monthly. 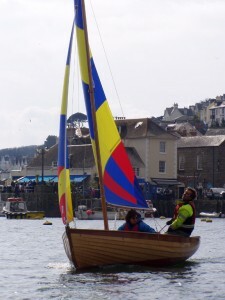 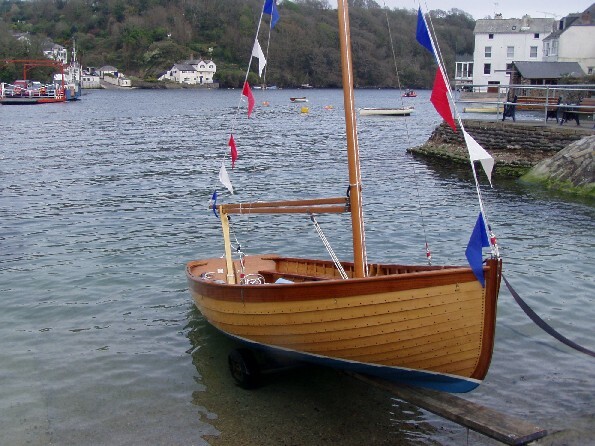 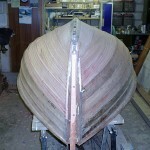 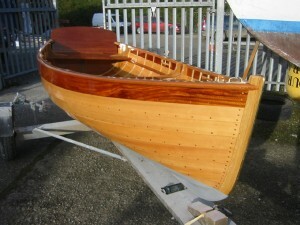 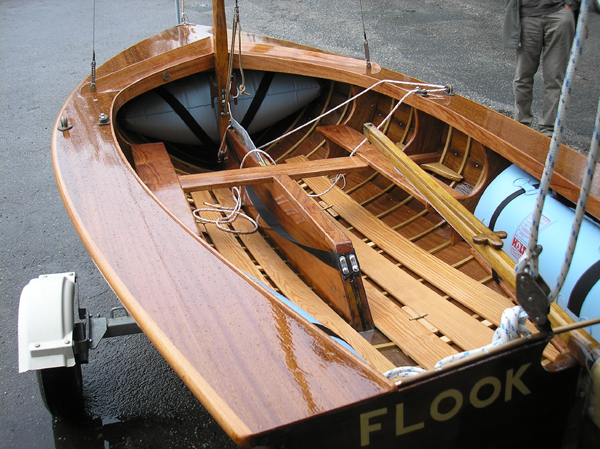 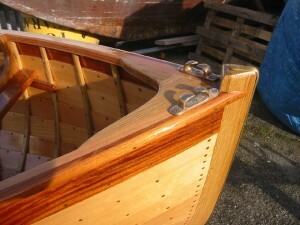 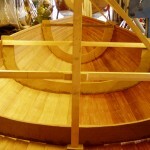 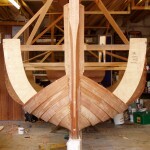 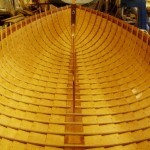 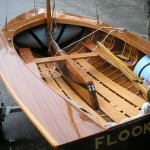 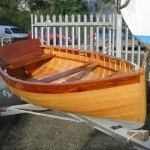 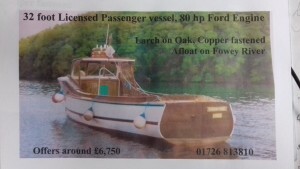 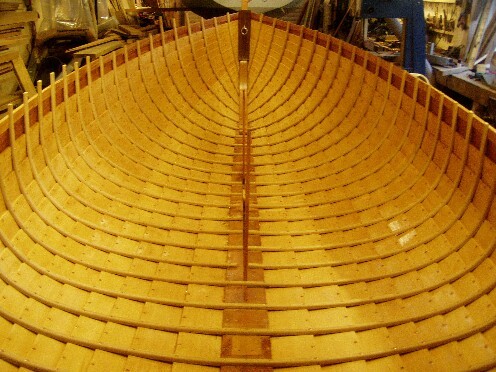 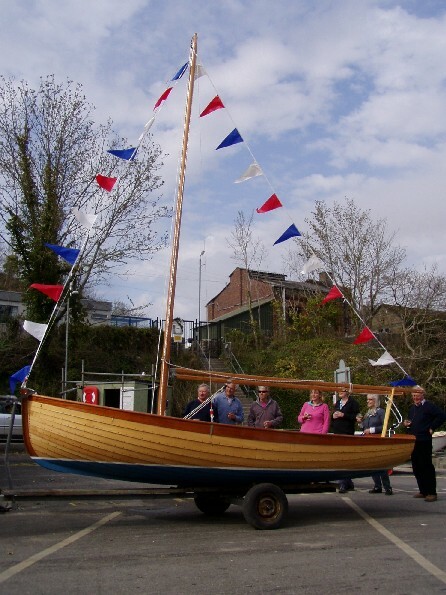 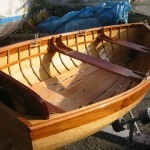 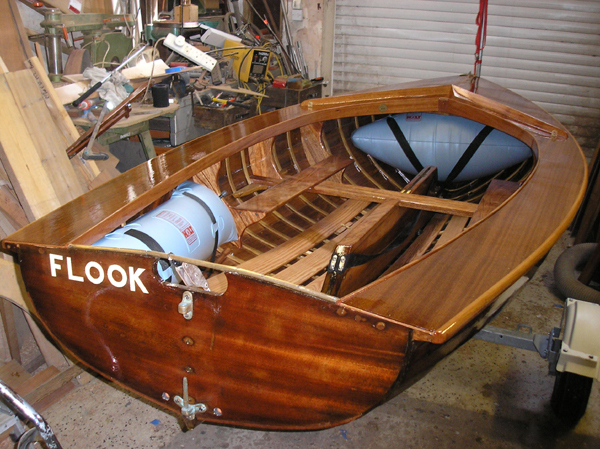 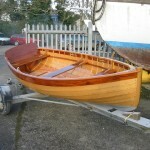 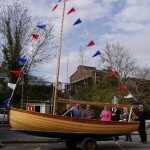 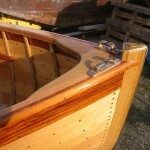 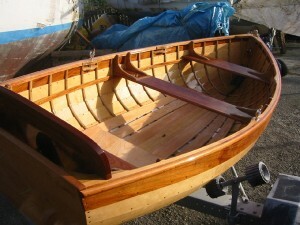 Wednesday 28th of April saw the launch of ‘Orinoco’ the latest Fowey River Class dinghy to be built by Marcus Lewis in the workshop at Fowey, in Cornwall. 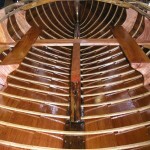 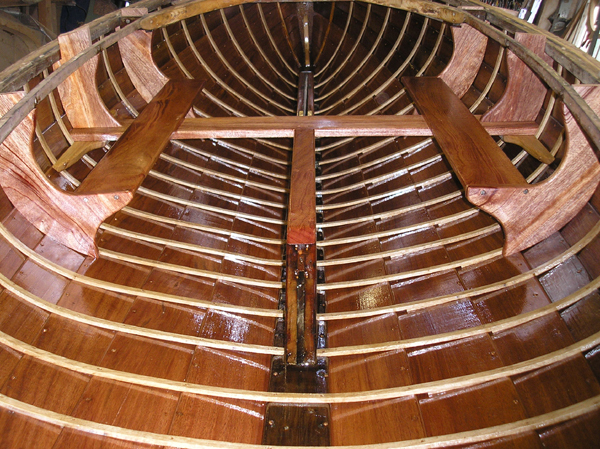 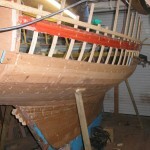 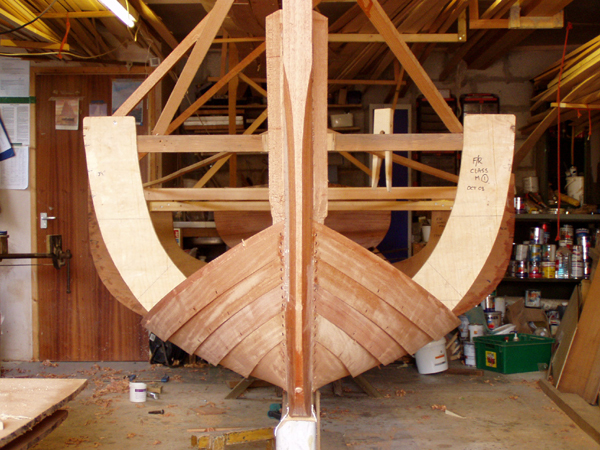 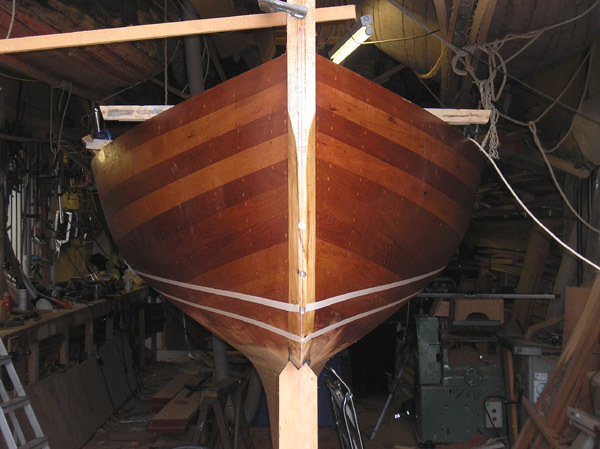 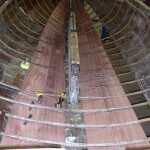 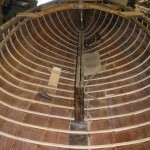 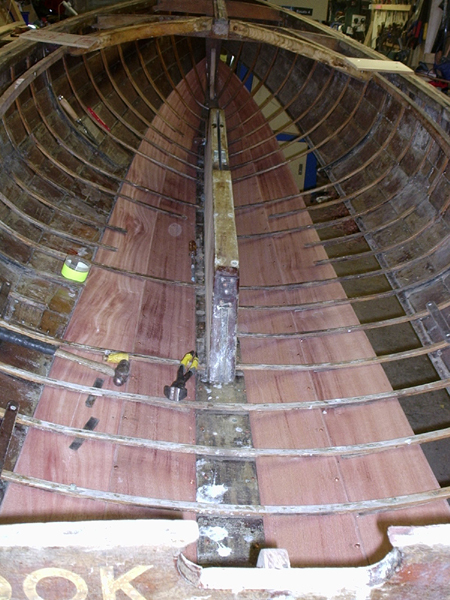 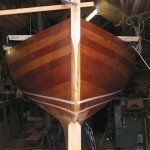 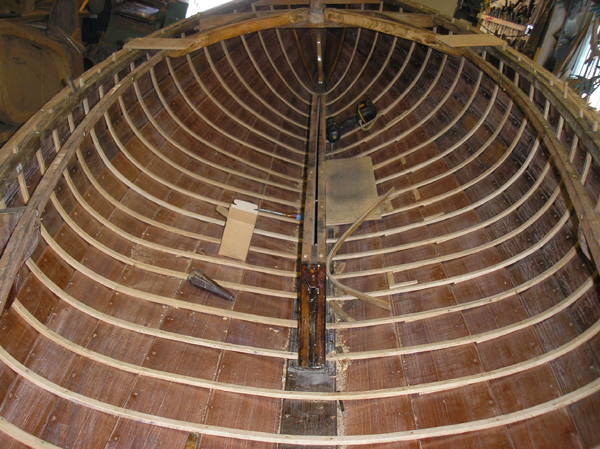 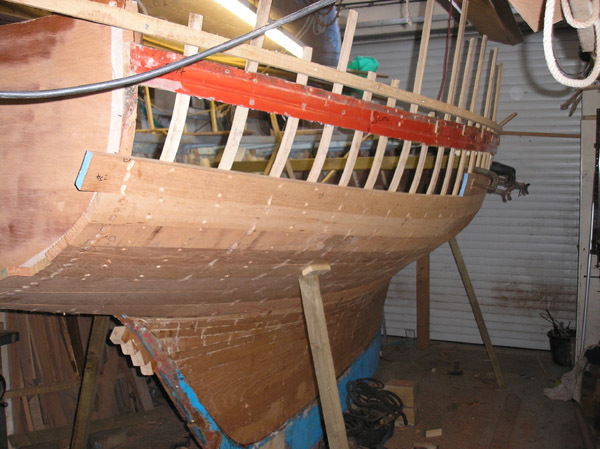 15 feet long, 5’9″ beam, clinker built of spruce and mahogany planking on steamed Oak ribs, with mahogany seats and centreplate box, all fastened with traditional copper nails and rivetted.